Review posted July 12, 2018. Atheneum Books for Young Readers, 2016. 132 pages. 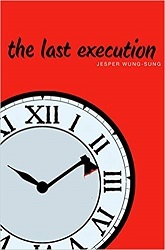 Author Jesper Wung-Sung lives in Svendborg, Denmark. On February 22, 1853, fifteen-year-old Niels Nielsen was beheaded on charges of arson and murder of the sheriff's son. This book fictionalizes that execution, getting us into the heads of Niels himself and various people who come to the execution. The book takes us through the final twelve hours of Niels' life, with a different perspective each hour, though usually going back to the boy, Niels Nielsen. He and his father had wandered the countryside for years, looking for work. But his father became less and less able to work. Meanwhile, people like the mayor, the baker, and the carpenter think about how horrible he must be to do that terrible thing and how their town will now be a better place. The book isn't pleasant reading. In many ways, it just feels sad and empty. But it is an exercise in perspective. And will perhaps make you look at society's outcasts with a little more compassion.